Accounts for Earth’s magnetic field at your location, so it always points to true North! 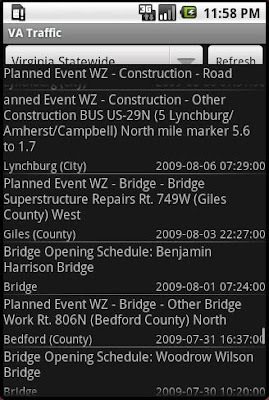 With this release, I’ve fixed a problem where only bridge opening schedules were showing up, not any roads. Also included are a couple of under-the-hood improvements that aren’t really noticeable. I hope this helps, and always feel free to comment or email me with questions or suggestions. 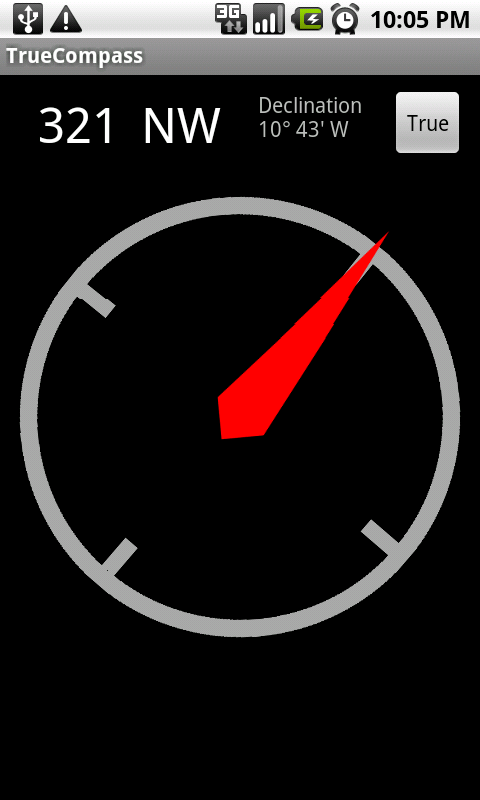 Also, with this release the app pulls data from a much more stable server, and I fixed a few bugs in the timestamp handling. That’s what the local news is calling it, at least. I went out yesterday and got some pictures. Keep in mind that I did this about five hours after high tide, so the water had already gone down a little bit from its morning peak. These folks were trying to tow their minivan out of the water. I took this picture right after their rope snapped. Police were blocking this street from both directions so that nobody would even try to get through. Which is probably good, because I saw people attempting some pretty stupid things. Submerged cars. You’ll notice this becomes a theme. These people were out taking pictures with their dog; I saw one of their pictures later on the local news’ website. I tried taking my dog along for this expedition, but she gave up after two blocks. This vehicle wasn’t abandoned yet, I think the owner was still sitting in it. Probably wishing you hadn’t parked your BMW on that particular block. You want to know what’s sad? So far these pictures aren’t even tidal flooding. They’re just areas that don’t drain. In the middle of this shot is Smith’s Creek. On the left is a road, Mowbray Arch a.k.a. the Smith’s Creek Annex. This is the only picture in this set with tidal flooding. Remember that BMW? When I came back by a tow truck was fishing it out. I hear that the waiting list for tow trucks is getting pretty long. “Neither rain, nor sleet, nor gloom of night”. What you can’t see in these pictures is that it was still raining hard. And the wind was blowing at 50 mph gusts. I have one big LinearLayout that encompasses the whole screen for the main Activity, and I had previous set the android:clipChildren property to false. Ooops. If you look at the documentation, this means that child objects aren’t being limited to drawing within their bounds. So I had a ListView that was coloring outside the lines, so to speak. Every time I scrolled the ListView, I think it had some trouble syncing up between the exact position of the screen and due to some rendering issue was drawing outside of its boundaries in an attempt to have a smoother draw of the ListView. Setting android:clipChildren to true fixed the problem. The application saves your region selection. Refresh now works the way you would expect it to. You click refresh, it refreshes. 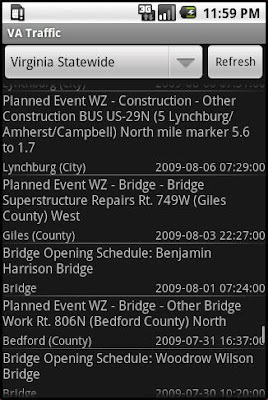 Sometimes in the list view, many of the incidents would be displayed twice each. For certain incidents, the detailed description would be either incomplete or the wrong description. 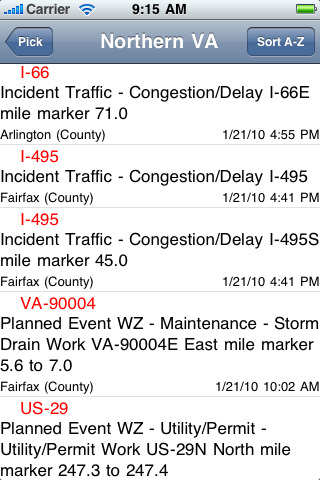 Wow, I’m completely surprised by the amount of downloads I’ve had in just one day since releasing the VA Traffic app. Now I’m really encouraged to either (1) expand to more states or (2) make a clone of the app for the iPhone. And at some point I’ll have to move the server-side stuff to something a little more robust than my desktop.